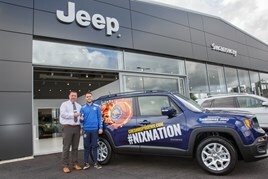 Swansway Chester Jeep has delivered a liveried Jeep Renegade to the Cheshire Phoenix basketball team as they extend a sponsorship deal into its second year. Swansway Chester operations director, Andrew Wakelin, said that he was “delighted” to continue the dealership’s association with Cheshire Phoenix. Wakelin added: “Sport is really important for giving role models, encouraging exercise and participation and bringing families together to enjoy the spectacle. Cheshire Phoenix fulfil all this, and are genuinely approachable, likeable lads”. James Brice, general manager of Cheshire Phoenix, said: “It’s great to have Swansway Chester Jeep on board as a sponsor for the second year. “Of course, Swansway Chester Jeep has the added bonus of retailing such an iconic American brand. Basketball has its home in the USA, so the tie-up is very special for us”.